With temperatures like today, most of us are enjoying the sun in the garden! Please don’t forget to take extra care of your four-legged friends during these hot summer months. Drinking Water – Your horse should always have access to clean drinking water. During hot temperatures their drinking intake will increase, meaning you will need to keep a close eye on their water if you manually top it up. Some horses need encouragement to drink, adding an electrolyte supplement to your horse’s diet will help this. Electrolytes restore any imbalances caused by sweating. However, we do not recommend giving this to your horse on a daily basis. Bathing – Giving your horse a bath during a hot day allows the body to cool down. Make sure you use plenty of cold water (especially after exercise.) You can do so using a sponge and bucket, or direct from the hosepipe if your horse allows you. Even though it seams like a good idea to keep your horse ‘dripping wet’ it is important to use a sweat scraper to scrape off any excess water. This prevents it trapping heat on the horses body.If cooling your horse down after riding, it is highly recommended that the horse is walked for until it has cooled down, and stopped ‘puffing’ in order to prevent muscle spasms. Shade – Shade is so important wen the sun is out! Having a field shelter or shaded area with good ventilation protects your horse from the heat and biting insects. If your horse ives out a reliable field shelter is a must! If your horse lives in with some turnout, it may be a good idea to turnout at night and keep them in during the day. Again, make sure that the stable has good ventilation. Fly Protection – Insects and flies are a big pain this time of year! Not just to our horses, but also to us! 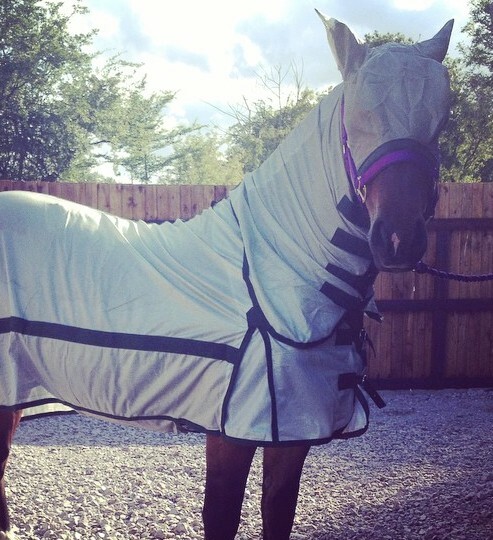 Keeping your horse covered in insect repellent really helps with keeping them flies away. No only a ‘fly spray’ helps to keep the flies away, but also a fly rug. These are lightweight and breathable and great for keeping them flies off. Suncream – Horses with pink skin are susceptible to sunburn (Especially on the nose). Pink skin requires a high factor sun cream to be applied regularly to prevent redness, blistering, discomfort and peeling. Exercise – If you’re planning on exercising your horse, try to do so when the weather has cooled. Ideally first thing in the morning or late evening when temperatures are lower. Paws – Dog paws are very sensitive! With all this hot weather the patio slabs are very hot, even to us! So please remember dogs paws are even more sensitive. Try to walk on the grass when possible. Walking – Try to walk your dog early in the morning or late at night. These are the cooler parts of the day, and will make the walk more comfortable for both you and your dog. Car – Cars can be deathtraps for dogs, even with the windows open. A car can go from comfortable to boiling in minutes! Never leave your dog alone in a car. Even a cloudy day or parking in the shade will not reduce the risks. The sun can move quickly and clouds can sometimes magnify the heat. Drinking – Dogs can only sweat from their paws! They cannot cool down like humans who sweat all over their body. Panting is a cooling method for dogs, but this can leave them extremely dehydrated. Make sure that your dog has access to plenty of clean drinking water. Cooling – Because dog can’t sweat, sometimes they need helping cooling down. Adding a paddling pool to the garden can help. Some dogs love to get in the pool to cool down. Another alternative is to soak a towel, leaving it wet and cool for your dog to lay on.